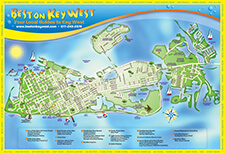 Enjoy a day of snorkeling and kayaking the way only Best on Key West can provide. You get to see it all on the Island Ting tour ━ the spectacular coral reef and the canopied mangroves in Key West’s backcountry. For a relaxing and amazing adventure, you can’t go wrong with our Island Ting tour. Best on Key West knows how to start the day right. We’ll depart for the Great Florida Reef on the Flyer, a 60-foot sailing catamaran. Passengers will enjoy a wonderfully homemade continental breakfast, which includes fresh pastries, egg dishes and assorted juices. During the 7-mile sail to the reef, our crew will provide you with the necessary snorkeling gear including a mask, snorkel, and buoyancy compensator. The crew will also demonstrate the proper way to use the equipment and give instructions on snorkeling safety. All of our gear is sanitized and safe to use. Then the real adventure begins. For an hour, you can swim among the amazingly colorful fish and marine life in this exotic habitat that is unparalleled in the United States. The reef is home to hundreds of different species of fish, turtles, coral, sponges and mollusks, ensuring you never know what you’ll see next! This area is visited by millions of people every year, and we know that you’ll want to return every year to catch another glimpse. When the snorkeling has concluded, our next stop is the Key West National Wildlife Refuge for lunch and kayaking. Our buffet, prepared and served by our island-famous catering company, includes peel-and-eat shrimp, fried chicken, Boar’s Head meat and cheeses, assorted breads and condiments, assorted side salads, fresh fruit and cookies. Once you’ve digested the tasty meal, we’ll lead you on a guided tour of the backcountry mangroves. Hop into a kayak and get ready for a look at the local wonder and beauty the Key West mangroves offer. You’ll see a plethora of fauna and flora as many different species live in this Wildlife Refuge. Great White herons, Green herons, Great Blue herons, Osprey and Reddish Egrets make their homes and nests in the mangroves. Keep your eyes open for endangered species like Brown pelicans, Key deer, American crocodiles, Hawksbill sea turtles, Atlantic Ridley sea turtles, Peregrine falcons, West Indian manatees and so much more. As the tour comes to an end and we set sail for Key West, we offer complimentary beer, wine and our homemade sangria to help you relax and reflect on all the wonder and splendor you experienced during the tour.